KENNEDY SPACE Center Director and former astronaut Robert D. Cabana was honored for his “exceptional leadership and executive guidance in leading the evolution of NASA’s Kennedy Space Center as the world’s premier multiuser spaceport in support of NASA’s exploration goals” with the presentation of the 2015 National Space Trophy April 24. 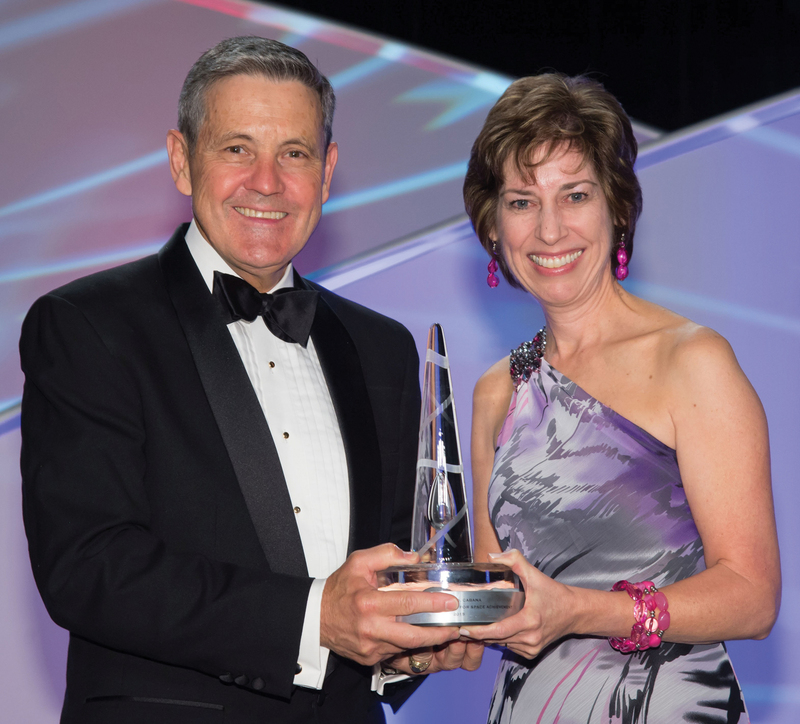 Johnson Space Center Director Dr. Ellen Ochoa, also a former astronaut, made the presentation at the Rotary National Award for Space Achievement Foundation Gala at the Houston Hyatt Regency before a crowd of 800 who gave the long-time Clear Lake resident a standing ovation. Colonel Cabana served as JSC’s deputy director before first being named Stennis Space Center director and then KSC director. 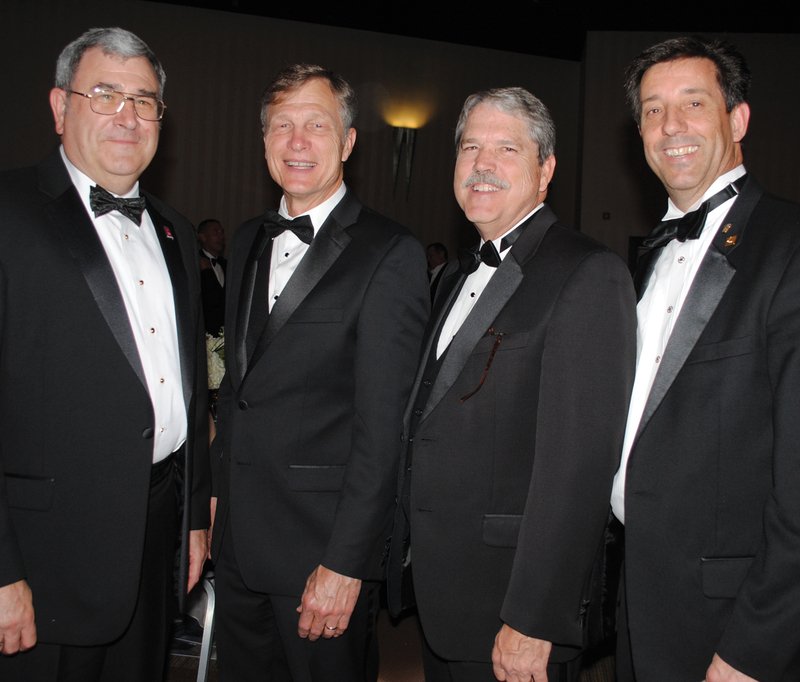 Space Center Rotary President Scott Rainey, right, and President-elect John Branch, from left, welcome Congressman Dr. Brian Babin and State Sen. Larry Taylor to the 29th Annual Rotary Space Gala. Delighted to be back with many old friends, the colonel joined Dr. Ochoa at the top of the hotel escalator to greet the arriving crowd – all of whom were happy to see him. Among them were eight former Space Trophy winners – Mike Coats, Gen. Kevin Chilton, William Gerstenmaier, Michael Griffin, Glynn Lunney, Tommy Holloway, George Abbey and Gen. Tom Stafford, many with their wives – and a number of astronauts, including Scott Parazynski, Michael Fincke, Michael Foreman, Michael Fossum, Patrick Forrester, Tom Marshburn, Richard Mastracchio, Donald Pettit, Stephanie Wilson, and Japanese astronaut Koichi Wakata and their spouses. 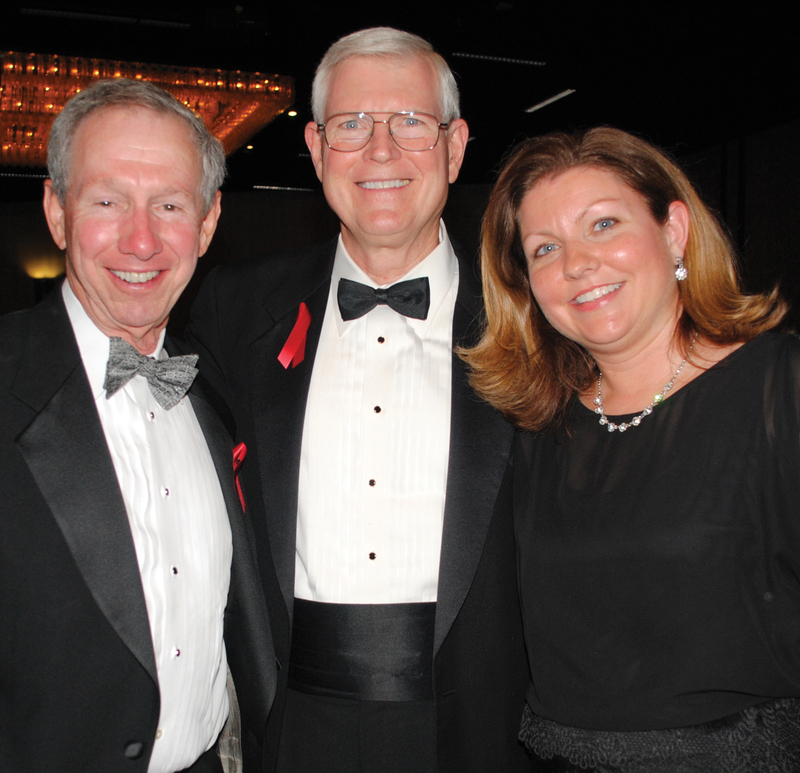 The 2012 Space Trophy winner and retired JSC Director Mike Coats, and his daughter, Lauren Larkin, right, visit with former NASA Administrator Dr. Michael Griffin, the 2009 Space Trophy winner who came up from Huntsville, Ala., for the Space Gala. Jacobs Technology VP Lon Miller was among those congratulating the honoree, as were Lockheed Martin VPs Art Ibers and Rick Hieb and Program Manager Rich Jackson; SpaceX VP Lee Rosen, Boeing VP John Elbon, Bastion Technology CEO Jorge Hernandez, Cimmaron CEO Jeannie Crowell and President Darren Crowell, ERG Principal Darryl Smith, Oceaneering GM Mike Bloomfield, Orbital/ATK Executive VP Frank Culbertson, ARES VP Melba York, Aerojet VP Steve Bouley, and their spouses. John Zarrella, former CCN correspondent covering space for more than 32 years, and current CCTV correspondent, served as the emcee bringing smiles to the faces of UHCL Dean Ted Cummings, Carolyn and Floyd Bennett, Pat and Wendell Wilson, Arnold and Eleanor Aldrich, Cynthia and Bill McArthur, Irene Chan, Bernie and Debbie Roan, Michael Suffredini, Mark Carreau, Linda and Duane Ross and Barbara and Jon Zelon. 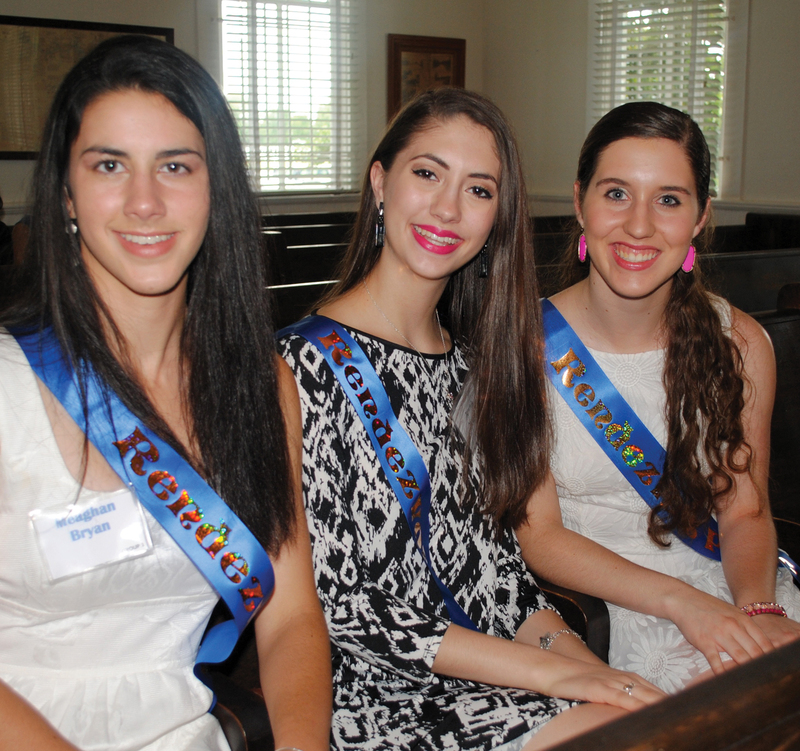 Three Lunar Rendezvous Princesses Meaghan Bryan, Jenna Westall and Bailey Breaux take a seat in the Bay Area Museum Chapel during this year’s Silver Tea. Rotarians were out in force including Scott and Martha Rainey, Patty and John Branch, Bob and Jordie Wren, Bill Geissler, Geoff and Vivian Atwater, Bill and Susan Taylor, Phil Harris, Joyce Morris, Jeffrey and Eliza Klima, Jeanette and Mark Hollis, Delia Stevens, Gary and Karen Johnson, Frank Perez, Wayne and Marilyn Musial and Bob Robinson of the Seabrook club. The Stellar Award winners were announced by two astronauts, Col. Randy Bresnik and Tracy Caldwell-Dyson, who then presented them with engraved marble trophies donated by Orbital ATK. 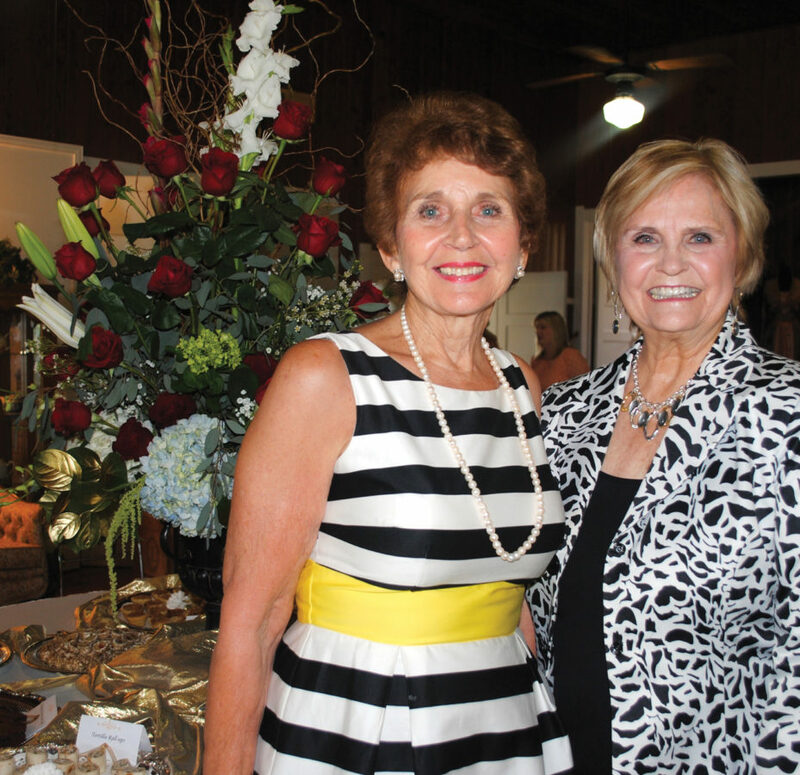 Silver Tea Co-Chairmen Dr. Peggy Clause, left, and Jan Larson have everything in place and are ready to greet the crowd. PAST BAY AREA Museum Guild President and community volunteer extraordinaire Angie Weinman is this year’s Silver Tea honoree. Joining Museum Guild members in honoring her were the Lunar Rendezvous Festival royal court – King Jerry Ross, Queen Allison Powell, Queen Alternate Demerle Monks and Capt. Jack Mullen and all this year’s princesses and lieutenants. Along with Angie’s husband, Matthew; son and daughter-in-law, Joshua and Sarah Weinman; and son-in-law and daughter, and their two young daughters, Made for quite a crowd! 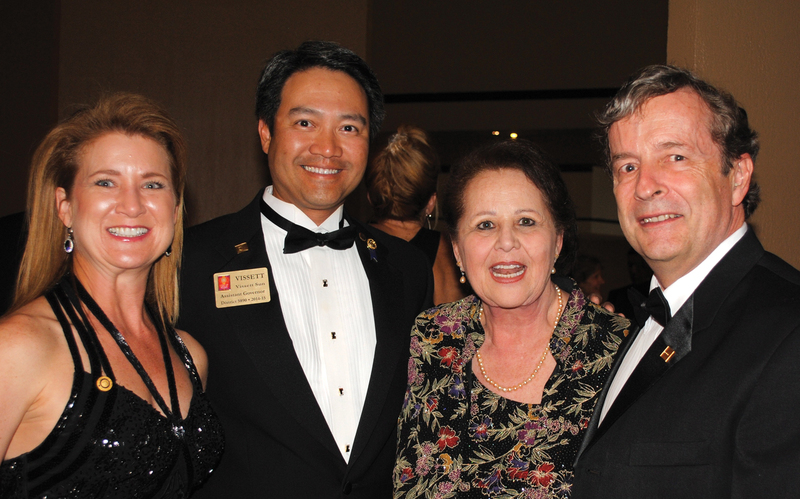 Dr. Vissett Sun and his wife, Adrienne, left, talk over old times with Donnie Johnson and Geoff Atwater at the Space Gala. Sun, Johnson and Atwater are all former Space Center Rotary presidents. Co-Chairmen Dr. Peggy Clause and Jan Larson were at the door to welcome Lunar Rendezvous Board Chairman Mike Landolt and his wife, Ann Wismer, Guild President Carole Murphy and other officers, Diane Dornak, Cindy Kuenneke and Dr. Kimberly Weathers while Jill Reason, Ava Galt and Sandi Quillen were checking to make sure all was in place for the arriving crowd. Glancing around you might have spotted the first and second Museum Guild presidents – Sharon Dillard and Chris Callahan, along with last year’s honoree Pat Biddle, Anita Fogtman, Joy and Charles Smitherman, Nancy Poffenberger, Betsy Bush and Martha Ferebee, who came from South Texas for the special occasion, Gloria Wong, Karen McCorkle, Emmeline Dodd and Gene Hollier, Pat Wilson, Annette Dwyer, Carol Bergman, Buck Rogers and Becky Reitz.